Are you ready for a brand new casual game? 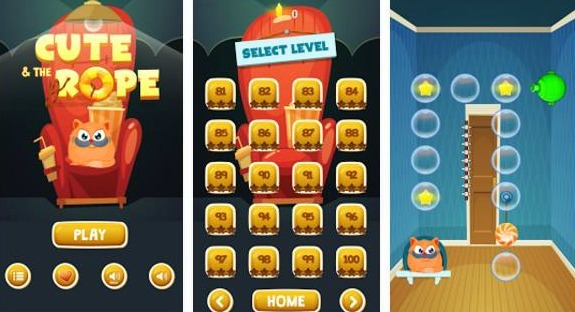 If you’re looking for a fun new casual game experience, than we have the perfect app for you. The app we will be talking about today is Cute & The Rope. It is a brand new casual game app that is available for both iOS and Android users alike. It is super easy to download and install, and on top of that it is free. The Cute & The Rope app is a fun new game where your main goal is to feed the cute little cat positioned randomly across all levels. It is a very kid-friendly game that doesn’t get up in your face. The app has tons of cool features, all scattered over 100 different levels. During gameplay, you can expect fun tasks like solving physics puzzles, playing with gravity, dropping candy and finding special items. You can even replay all unlocked levels for even more fun. You can also customize the difficulty of each level, depending on your difficulty taste. The game is rich with tons of fun features. It is also free to download and play, and easy to install too. You can find and download this app from Google Play or the App Store, depending on your device.